BEAUMONT, Texas – The prolonged misery from Hurricane Harvey peaked here Friday in the southeast corner of the state, where a crippled municipal water system left residents with no running water, unable to flush toilets, desperate for basic sanitation and fearful for their health. Meanwhile a massive fire sent a towering pillar of acrid black smoke from the Arkema chemical plant northeast of Houston, hours after company officials said there was nothing they could do to stop 19.5 tons of volatile chemicals from igniting. Beaumont’s dire situation and the uncontrolled chemical fire near Crosby, Texas, provided vivid reminders of the cascading effects of a natural disaster: wind, storm surge, torrential rain, floodwaters, and now all the secondary consequences, including industrial accidents, environmental contamination and broad concerns about sickness and disease. President Trump’s Office of Management and Budget sent a request to House Speaker Paul Ryan on Friday night for $7.85 billion for response and recovery to the hurricane, describing the money as a “down payment” on the president’s promise to help states recover from the storm. In Crosby, residents remained evacuated Friday within a 1.5-mile radius of the burning Arkema chemical plant. The plant lost power and its backup generators were flooded earlier this week, leaving workers unable to maintain refrigeration of volatile organic peroxides. The chemicals combust if not kept cool. As an emergency measure, the chemicals were moved into nine box trailers, one of which was burned Thursday. The floodwaters have now receded, but Daryl Roberts, Arkema’s vice president of manufacturing, said Friday that the company can’t restart refrigeration because the electrical infrastructure has been underwater for a week. “We believe that right now, the scenario that is available to us is to let that material burn out,” he said Friday morning. Friday afternoon, chemicals in another one of the trailers caught fire. The heat from the blaze then ignited the chemicals in an adjacent trailer. The two trailers burned simultaneously, producing multiple explosions and fireballs, said Robert Royall Jr., assistant chief of emergency operations for the Harris County Fire Marshal’s Office. That left six intact trailers, parked in a remote section of the plant, each holding chemicals steadily warming and likely to ignite explosively. “We could see all six of these containers engage really quickly,” Arkema executive Richard Rennard said Friday evening. The Environmental Protection Agency late Friday said it was flying a surveillance aircraft through the smoke and monitoring for toxic chemicals. The chemical plant’s crisis has brought attention to the heavy industry in the flood zone, and the U.S. Chemical Safety Board on Friday warned oil and gas companies to be extremely cautious in starting up refineries that had been shut down as a result of the storm. 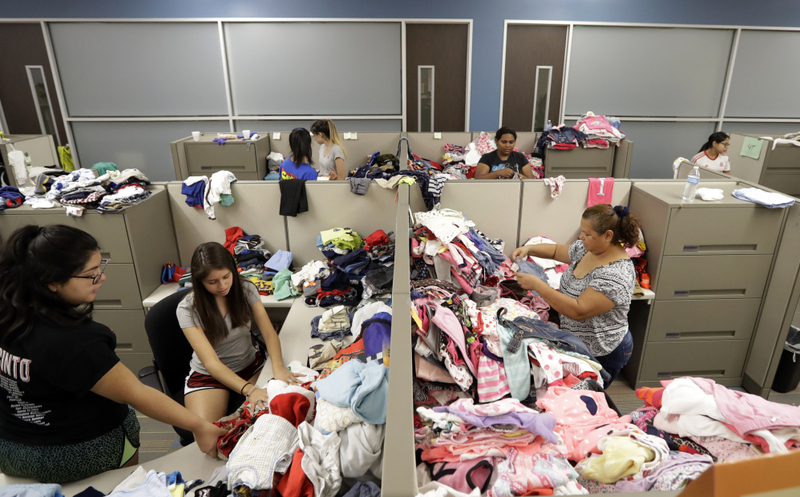 In Beaumont, conditions in two large shelters holding 1,400 storm survivors became so dodgy Friday that officials were forced to evacuate as many people as possible. The officials said they couldn’t take care of people without access to water. Many of Beaumont’s 118,000 residents had tried to leave this week but had been blocked by high water when Harvey, still a tropical storm and making a second landfall, turned the city into an island. They had no choice but to turn back, often choosing to drive the wrong way on flooded Highway 90. Government resources for Beaumont appeared to be slow to arrive Friday, and tempers flared as people scoured grocery stores for whatever food was left. “When you take water out of the picture, people start to panic a bit,” said Halley Morrow, a police spokeswoman. 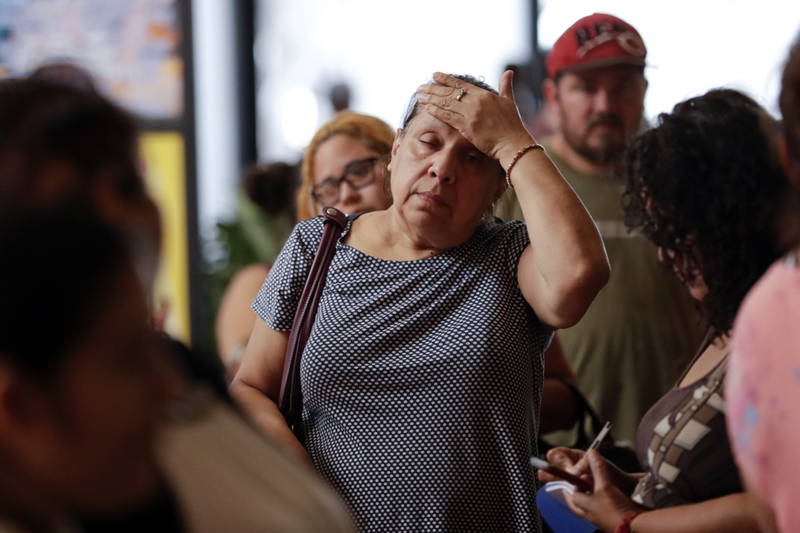 At the George R. Brown Convention Center in Houston, where 7,500 people have taken refuge, the U.S. Department of Health and Human Services reported treating 420 people, many complaining of diarrhea or vomiting that could be associated with contaminated floodwater or a virus. The convention center has seen a number of drug overdoses, and people have arrived seeking methadone, or other opioid-addiction treatments, and have been told that there are none available. CVS and Walgreens have set up mobile pharmacies there, with limited supplies of medication. Statewide, tens of thousands of people have taken refuge in shelters. Countless more are dislocated, staying with friends, family and strangers. On Friday, Houston Mayor Sylvester Turner called for residents near the Addicks and Barker reservoirs to evacuate as the Army Corps of Engineers continues to release water from the reservoirs. President Trump is scheduled to visit Texas and Louisiana on Saturday, and his trip is slated to include a stop in Houston, said his spokeswoman, Sarah Huckabee Sanders. 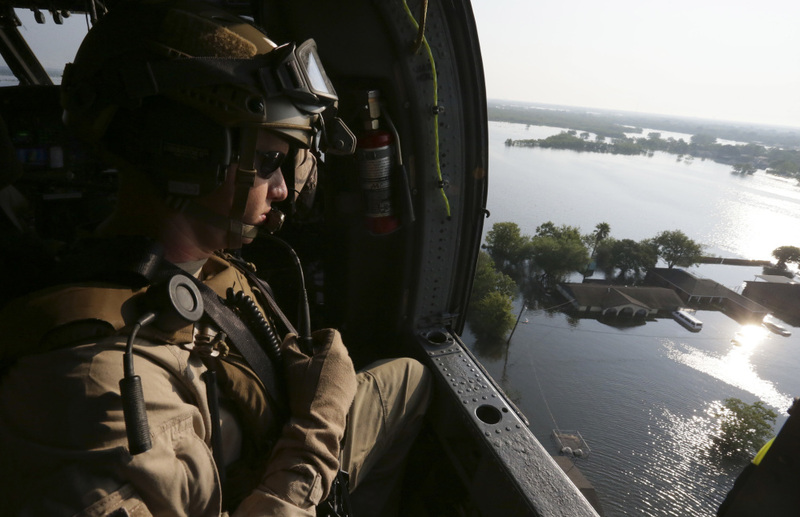 Texas is gradually switching from search-and-rescue mode to recovery mode. As of midday Friday, officials across Texas had recorded at least 45 deaths confirmed or suspected of being stormed related. Gasoline, or the lack of it, has become a preoccupation, as motorists in many cities, even far from the major flood zone, have found stations sucked dry. Gov. Greg Abbott blamed media reports about gas shortages and an ensuing rush on the filling stations. The weather has cooperated late this week, with bright sunshine replacing days of downpour. A ridge of high pressure in the atmosphere should keep any developing tropical system in the Gulf of Mexico far away from Texas – an improved outlook since Thursday. Most of the people who lost power in the storm now have it back. But American Electric Power, a Texas utility company, estimated that the cities of Rockport, Fulton and Aransas Pass would not have power fully restored until Sept. 8 – two weeks after Harvey first made landfall. At least 185,000 homes had been damaged, according to the latest tally from the Texas Department of Public Safety, but that number does not include heavily affected Beaumont and densely populated Houston. Some 440,000 Texans have registered so far for FEMA disaster assistance, the governor’s office said. In Port Arthur, a city ringed by refineries, the floodwater that rose so dramatically earlier in the week, and which had required frantic evacuations, was taking its time to recede Friday. Some neighborhoods still had waist-deep water. Convenience stores and gas stations had started to reopen, and signs of normalcy began to appear under the harsh sun. In the El Vista neighborhood, Paul Jackson said the water had dropped about a foot, though it was still up to his thighs. “That’s promising for us,” said Jackson, 50, who has been living in a camper parked along the highway at the entrance to his neighborhood. Some residents had begun getting texts from FEMA alerting them that they were eligible for free hotel room vouchers. Some in Beaumont managed to fly out of town after an initial attempt to leave by bus was stymied by high water. Others left shelters and returned home. A line of hundreds of cars snaked along a highway frontage road as motorists queued up for water being handed out by the city and donated by the Texas grocery chain H.E.B. The city took on a ghostly quality. Grocery stores and restaurants appeared open at first glance, and in the evening were illuminated and seemed inviting. Motorists circled them, but there was no going inside. Store aisles were empty, the doors locked and protected by sandbags. With no running water, there was little cooking that could be done, and no way for employees to wash their hands. No fresh produce or supplies could be delivered to Beaumont through the floodwaters encircling the city. The odor of flood rot began to permeate the air. Pamela Starks, 59, pushed her cart inside the Walmart Superstore, getting lucky enough to nab four cases of water. “They got water?” another woman shopper asked anxiously. Outside, Angela Williams, 48, stood with her sister, son, daughter-in-law and two toddler grandchildren in the scorching sun. The family had been rescued from their flooded homes in Port Arthur three days earlier. Their first shelter flooded. They moved to a second shelter, but there was no food and no water. Now they were crowded – 13 people all told – into the small home of a friend who also had no running water. It was midafternoon and they had just had their first meal of the day: One doughnut for each person.